​but rather feelings, rituals, and play. If you study religion with an anthropologist's mind, you realize that religion is not always or even primarily about beliefs and texts; and that it does not rely on language. It is about feelings of awe and wonder; about the will to live with satisfaction relative to the situation at hand; about shared rituals and social relations; about enjoying the liminal pleasures of play; and about making some sense of the world in which you live through feelings and not ideas. It may or may not entail what we humans call ethics: empathy and reciprocity. It is nice when it does, especially for adult humans. But human infants practice religion before they have languages; and so do other animals, sometimes in quite advanced forms, given their forms of intelligence (kinesthetic, auditory, visual). The practice of religion emerged evolutionarily and existed long before the emergence of homo sapiens. Human religion is a latecomer. The current expressions of human religions co-exist and co-evolve with continuing expressions on the part of other animals. Inter-religious dialogue among human beings need to be expanded to include listening to and coming to appreciate the spiritual sides of other animals, cognizant that in some ways their "practice of religion" may be much healthier than human practices. Toward this end, studies in cognitive ethology can play an important role, as can studies in animal psychology. Informed by such studies, and also by time spent in the presence of animals, inter-religious dialogue rightly extends into inter-species cooperation, such that we learn to live with, not against, other animals who are are companions on a small but vibrant planet. We learn from them and consider them our companions, mentors, and elders. Indeed, as one Christian theologian puts it, they can be priests for us. See Carter Heyward, Ordaining Horses as Priests. 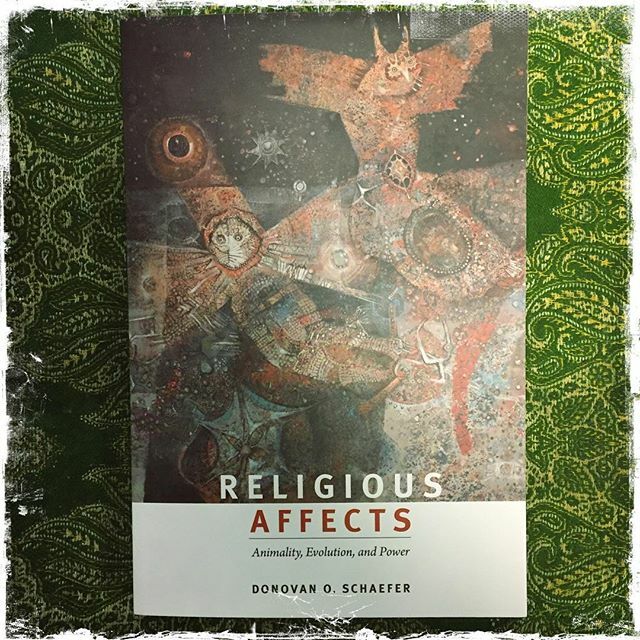 "In Religious Affects Donovan O. Schaefer challenges the notion that religion is inextricably linked to language and belief, proposing instead that it is primarily driven by affects. Drawing on affect theory, evolutionary biology, and poststructuralist theory, Schaefer builds on the recent materialist shift in religious studies to relocate religious practices in the affective realm—an insight that helps us better understand how religion is lived in conjunction with systems of power. To demonstrate religion's animality and how it works affectively, Schaefer turns to a series of case studies, including the documentary Jesus Camp and contemporary American Islamophobia. ​Placing affect theory in conversation with post-Darwinian evolutionary theory, Schaefer explores the extent to which nonhuman animals have the capacity to practice religion, linking human forms of religion and power through a new analysis of the chimpanzee waterfall dance as observed by Jane Goodall. In this compelling case for the use of affect theory in religious studies, Schaefer provides a new model for mapping relations between religion, politics, species, globalization, secularism, race, and ethics." Donovan rejects the Euro-American tendency to equate religion with belief, text, and language. Religion is something we feel in and express with our whole bodies, Schaefer insists, and once we realize this, we are free to see religion in other animals in certain instances of their embodied and emotional practices. The “prelinguistic dance” of wild chimpanzees at a waterfall, then, is religion for Schaefer, who goes further than Goodall in interpreting the meaning of apes’ rhythmic bodily movements in certain natural contexts. When I contacted Schaefer, he underscored in an email message to me the embodied nature of all religious practice: “The really thick, powerful elements of religion seem to come about in a sensory relationship with the world (whether that’s the natural world or the cultural world of stories and communities) that evokes awe and reverence. Compared to us, other animals, Schaefer told me, “have different life-worlds, different fascinations, different interests emerging out of their complex evolutionary histories. That could be waterfalls, wildfires, storms, or features of the landscapes where they live, work, and play that somehow stick out for them. Their religions will be built out of their fascinations, just as our religions are built out of ours. The theory of evolution helps me to understand the natural world in relation to God’s love. Authentic love requires freedom, and evolution describes the way that nature is free to love God. As humans, animals, and plants make their way through the processes of nature, a loving God does not control nature, but God is present in creative natural processes and with creatures. Evolution not only opens my eyes to the complexities of nature, but opens my heart to the depth of God’s love, wisdom, and creativity. Deep appreciation of the beauty of nature generates a deep and intense knowledge of God, which is the mind’s worship. "It is good news that the indigenous people are coming into their own. They have endured decades of bitter persecution – they were killed by the hundreds of thousands and their traditions brutally suppressed. Yet against all odds, in spite of the risk of punishment and even death, many of the elders, the spiritual leaders and shamans, the medicine men and women, secretly held onto their cultures and their beliefs. And now they are joining forces around the globe reaffirming the connectedness of all life and the spiritual power of the Creator. They are reminding us that, as St. Francis said, the winged ones and the finned ones and the four-footed ones are indeed our brothers and sisters, that their lives matter too. 1. They have subjective aims of their own. They seek to survive with satisfaction relative to the situation at hand and foreseeable future. 2. They prehend their surrounding worlds: that is, they feel the presence of the worlds around them with something like awareness. 3. They have emotions: that is, they feel the presence of the worlds around them with emotions of pleasure and pain, attraction and repulsion, curiosity and fear. 4. They make decisions. This means that, in the moment at hand, they consciously or subconsciously select certain possibilities for responding to the situation at hand, and simultaneously cut off or eliminate other possibilities in that moment. 5. They have intelligence. Along with educational theorists such as Howard Gardner, many process theologians recognize multiple forms of intelligence: verbal-linguistic, mathematical-logical, bodily-kinesthetic, visual-spatial, musical-rhythmic, naturalistic, interpersonal (knowing the subjective states of others), and intrapersonal (knowing one's own subjective states), Animals have many of these forms of intelligence, and in many instances their intelligence exceeds that of humans. ​6. They have religion. Or something like it, spirituality. At least this is what Donovan Schaefer proposes. Process theology agrees with Jane Goodall that Intelligence is involved in the formation of the universe and that there is a Mind and Purpose underlying our existence. Indeed it sees God as the Embodied Mind of the universe, whose non-coercive lure over vast stretches of time has inspired the universe to create new forms of order and ordered forms of novelty, and in whose very life the universe unfolds in a continuous way. This way of thinking is sometimes called pan-en-theism, which literally means "everything inside God." Panentheism is the idea that everything in the universe is part of God but that God is more than everything added together. This way of thinking can be especially important to people with ecological sensibilities, because they can combine faith in God with a love of people, animals, and the earth. They can say that living with respect and care for the community of life is one way of contributing to God's own life and also that God is in some way in the community of life itself: on the earth, in the soil, in plants and other animals, and in us. Here God is not so far away, as if on a throne in the sky. The subjective states of animals are known, appreciated, and shared by God. God feels the feelings of animals and is affected by what is felt. God -- the very Soul of the universe -- knows what it is like to be a frog, a cat, a bird, a dog, an octopus. God appreciates animals on their own terms and for their own sakes, not just for value (aesthetic, spiritual, or utilitarian) for human beings. Moment by moment, animals, too, are inwardly lured by the very spirit of God toward whatever forms of richness of experience are possible for them. When animals seek to survive with satisfaction, God is within them as their very seeking. Of course God is within everything else, too: the hills and rivers, the trees and stars. Process theologians believe that there is something like "feeling" or "experience" all the way down into the depths of matter, and that other forms of life seek their own well-being, their own enjoyment. The lure toward richness of experience is in them as in us, and we rightly live honoring that lure, doing our best to live lightly on the planet and gently with other animals, for their sake and for God's sake. This very way of living adds beauty to the ongoing life of God, who likewise seeks richness of experience.